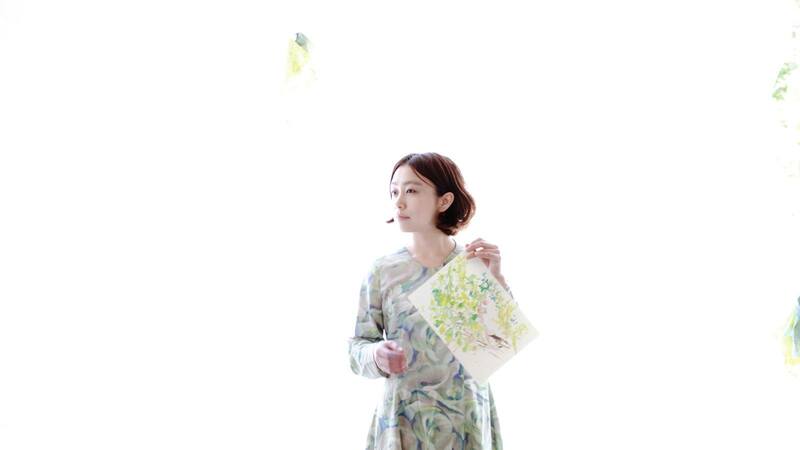 Shiho Ueda was born in Hyogo prefecture in 1985. She has created a series of artworks titled “What colors do”, which reflects her capturing organic movements of ‘color’. Also as her life’s work, she has performed improvised drawings titled “In a Flowerscape”, which emerges ‘color’ with botanical motifs from personal memory and consciousness of a client through a dialog . ・ Study of interior design and arts at the Kyoto University of Art and Design. Since 2006 she works under her leading theme of ‘the manifestations of colour’ as an independent artist in her studio in Osaka, in two and three dimensions and exhibits her work in Japan as well as in Europe. The human eye can distinguish between tens of millions of colors. Even if we don’t know every individual color’s name, I believe we can actually feel these myriad colors. For example, even in a small aquarium the space maybe small, but we can feel the many colors that exist in the universe that bring out inspiration and many colorful emotions from within us. Also, our daily lives are over flowing with these countless colors nd I try to express every single colors by linking each color to an emotion and then drawing a picture. No matter the place or time, if you look carefully, we can instantly find colors that make our hearts dance. personal drawing:Your favorite flower and verb in motif to draw the color of image .